Retail, Commercial and Flex Lots between 1.41 and 5.24 acres are available for sale on Monocacy Boulevard. The adjacent Riverside Corporate Park’s tenants include the Mid Atlantic Regional Headquarters for Wells Fargo Home Mortgage, Aldi, Charles River Laboratories, the National Cancer Institute, and Frederick Brickworks among others. Signalized access is planned. 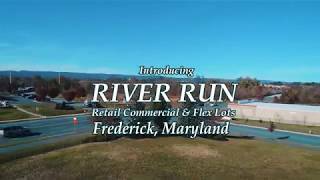 River Run is located a short distance from the Shops at the Monocacy, Clemson Corner, and Market Square, which all include a variety of national restaurants and retail stores.